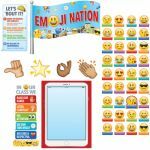 The Emoji Fun Emoji Nation Bulletin Board brings the sweet, silly, smiley emoji faces and icons to your bulletin board to welcome students in social media style! 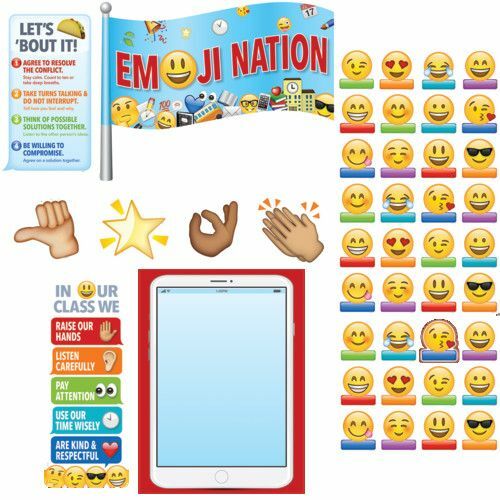 Create an "Emoji Nation" in your classroom and your students will be the Emoji citizens. Each student will be represented by an emoji face. Emoji faces are easily identifiable and universally recognized making this set perfect for non-readers, non-English speaking students (ESL/ELL), and children and adults of all ages. 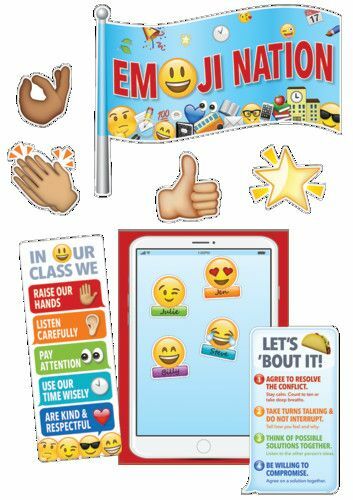 Set includes: • 1 large "Emoji Nation" flag (22" x 17") • 36 student emoji faces (4" x 4.5") • 1 "In our class we" sign (raise our hands, listen carefully, pay attention, use our time wisely, and are kind & respectful) (8.5" x 21.5") • 1 "Let's Taco 'Bout It!" sign (agree to resolve conflict, take turns talking & do not interrupt, think of possible solutions together, and be willing to compromise) (9.25" x 17") • 1 large smart phone blank chart (17.5” x 24”) • 3 hand accents (thumbs up, hands clapping, o.k.) 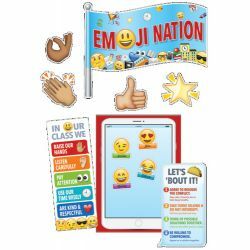 (approximately 6" x 7") • 1 star (approximately 8" x 7") • Instructional guide Social media lovers will LOVE the Emoji Fun Collection! Sweet and silly emoji faces will bring a bit of digitally inspired fun to any classroom, church, daycare, or school setting! Use this set on a bulletin board to welcome students, parents, and faculty to the first day of school, back-to-school night, parent night, open house, and more! Or use this bulletin board set at a daycare, senior living residence, college dorm, or other school setting to welcome visitors and residents. The student pieces can be used for a variety of content-related activities such as sight word memory games, word family matching, and number identification for children in elementary school.